Customers often send us images of multiple ring designs in which they like some details and would like to incorporate these to make something all their own. We really enjoy doing such custom rings not only because they offer a bit of a challenge but also because we appreciate the thoughtfulness of someone who makes the extra effort to create something unique for their loved one. Often times just a small detail can make a big difference in making something all the more special. We recently had a customer send us a picture of a ring design his girlfriend really wanted. 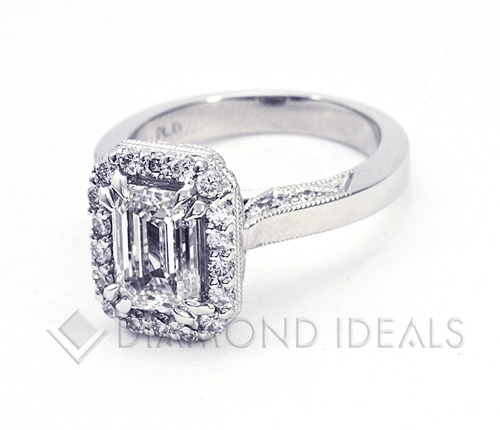 The ring had a halo of diamonds around an emerald cut center stone but the diamonds around the center stone were very small and seemed out of proportion. The ring had a lot of intricate detail under the head/halo and some extra detail, in an otherwise plain shank, which we didn’t think did much for the overall look and balance of the ring. We decided to use slightly larger diamonds around the center stone and to eliminate the detail in the shank, keeping that part of the ring simple and drawing focus to where the center stone is. In making those two minor modifications, it balanced the detail and proportion, gave the ring a lot more ‘pop’ and made the ring a little extra special. After the customer approves the design it is then printed into a wax model, a mold is made around the wax and the metal cast into the mold. The ring is then cleaned, pre-polished, set, polished and rhodium plated (for white gold and platinum). All the setting details, pave beads and milgrain (beaded edging) is added by hand, during the setting process, providing a higher level of craftsmanship and finer detail. Working together via email and phone we sent him images and information to help him make an informed and confident decision regarding the diamond. He ultimately decided on a gorgeous emerald cut that had outstanding brilliance and shape appeal compared to the other stones we reviewed for him. The completed ring is pictured above.